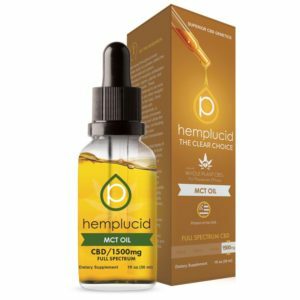 Hemplucid CBD MCT Tinture is their whole plant Full Spectrum CBD paired and bound to MCT coconut oil. MCT (Medium Chain Triglycerides) are a virtually ordorless, colorless and easily digested carrier oils. This type of oil is readily absorbed by the GI tract and easily metabolized by your liver. They may also play a role in encouraging your body to burn fat for energy instead of storing it. GMP Certified, Non-GMO, USDA Organic and Kosher. Taken orally or can be mixed into food recipes. Available in 250mg, 1000mg and 1500mg sizes.